1. Melt chocolate chips in top of double boiler over very low heat. Stir until melted. 3. 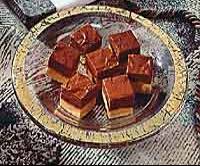 Stir in condensed milk, butter and vanilla (or instant coffee if making mocha fudge). 4. Blend until butter is mixed with the chocolate. 6. Spread mixture immediately into a lightly oiled 8-inch square pan. 7. Cool at room temperature. Cut into even one-inch squares and enjoy!